I remember wearing pigtails as a little girl and loving it. I loved the way my hair bounced and swished from side to side whenever I walked. I thought it was quite the thing. I would carefully deliberate on what color hair ribbons to wear and smugly thought myself as cute as a pup. Really, as a curly-haired girl in a country where most everyone had gleaming straight locks, a moment of bright-eyed, optimistic hair-love is truly a treasured memory. As I watch my daughter today, bounding ahead of me, with those two very same pigtails, ringlets bouncing jauntily, it throws me back to those carefree times of childhood, when everything was exciting and my years-long battle with my wild locks was yet far in my future. I smile and thank God that I have the chance to revisit, and re-experience, those rose-colored nooks and crannies of time, all through this spunky little package C and I have been gifted with. C remembers this spaghetti. If not technically from his childhood then from the time when he still lived with his mother. P. Cruz is the street where he lived and thus we’ve dubbed this P. Cruz Spaghetti. I hardly ever use mince in pasta sauce (except for meatballs), but to recreate C’s homely favorite, I break my own rules. NOTE: Please read updated notes below with my more current tweaks! – Prepare the pasta as per package instructions in well-salted water. Keep some of the pasta cooking water aside in case you need it. – Heat a heavy-based pot over medium-high heat. Add a couple of generous swirls of olive oil. When the oil is hot add the onions and half the garlic and sauté until the onions are soft and translucent. Add the Italian seasoning and stir, sautéing until the smell of the dried herbs wafts up. – To this add the ground beef and sauté, stirring, until the beef browns, breaking up any clumps. At this point remove as much or as little of the oil that the beef renders. – Add the tomatoes, the water (rinsing out the can in which the tomatoes came), tomato paste, sugar, salt and pepper to the pot. Stir everything together and simmer over low heat, stirring occasionally, for an hour or two, crushing the chunks of tomato against the side of the pot with your wooden spoon. I sometimes let this go for even longer. You want the sauce to cook down, becoming thick and pulpy, and the flavors of the sauce to meld into the meat. – While the sauce is simmering (or even while you are making it if you are more dexterous) get on with your mushrooms. Heat a large skillet over medium high heat. Add a good glug of olive oil and when the oil is hot add the mushrooms and the rest of the garlic. Add a scattering of salt and pepper and sauté until the mushrooms soften and become golden. You want them to release their juices and then have those juices evaporate so the mushrooms’ flavors intensify. When done, add this to the tomato sauce and carry on cooking until the sauce is done, tasting first to adjust the seasoning. – Serve with grated parmesan cheese and garlic bread if you want to be faithful to the P. Cruz way. Some caveats here. I know the thought of adding sugar to pasta sauce may seem scandalous to some, and I don’t usually, but this is the P. Cruz way and I am not one to stand between my husband and his nostalgia. Besides, I honestly think that, used scrupulously, a little sugar can take the edge of canned tomatoes, you just need to strike a good balance. In any case, if it goes against your beliefs, by all means leave it out. The Italian seasoning, that little bottle of mixed dried herbs by McCormick that you can find in most supermarkets, is also essential to the spirit of the original dish. So yes, fresh herbs are fabulous, and as far as dried herb/spice mixes are concerned there are more sophisticated ones, but, again, we are going for the taste of nostalgia here. All that being said, I must be honest and confess that I couldn’t help make some adjustments. The original was made with tomato sauce but I really, really prefer canned tomatoes. Also, the original used canned mushrooms but since we can get such great fresh ones locally (I get mine from the Ministry of Mushrooms), and fresh are really so much better than canned, I use fresh here. So I supposed I wasn’t that diligent about strictly adhering to tradition. Oh well. We make our own marks on recipes. Perhaps little C will add her own tweaks one day. I hope she does. In the meantime I am content to stir this pot and thankful to enjoy childhood a second time around. Note added February 13, 2018: Made another large batch of this just a bit different from the last 2014 update — 1 kilo ground beef, 1 800-gram can and 3 400-gram cans crushed tomatoes, more water to rinse out the cans (maybe just under half of the 800-gram can), and one 70 gram pack of tomato paste. I also added a carrot…fine dice or run through a grater if you’re lazy like me. For the mushrooms I used 1 250-gram pack Swiss brown mushrooms and 1 250-gram pack baby portobello mushrooms…cooked as above. Of course I increased the other ingredients as well like the Italian seasoning. I also added a teaspoon of smoked paprika to give it a nice kick. Salt and pepper throughout to taste. Sugar to taste as well — your don’t have to add sugar if you don’t want to but let me just say that the sugar here is not to turn this into sweet spaghetti (I actually love sweet spaghetti but I am the only on in my family who does), it is used more to balance the flavors and round out the acidic tang you get from canned tomatoes. And I just need to stress, give this enough time to cook — you need the meat and tomatoes to meld into a sauce, becoming one being instead of two separate ones. I’ll cook this for hours, just letting it blip away on the stovetop, while I do other things, just returning every now and then to give it a stir and make sure nothing is sticking. Oh, and it’s also nice to finish this off with a good swirl of extra virgin olive oil to finish. Yummy! You write so beautifully! I also like bolognese done the Pinoy way! I recently went to Bologna and of course tried Bolognese, and it was so beefy bordering on funky! And so, from that moment on, I have become loyal to the bolognese of my childhood. My mother adds a can of cream to her meat sauce which turns the sauce to a shade of brown. And yep, definitely some sugar to balance the sourness of the tomatoes! This looks super tasty and I love to try it!!! I love this recipe! It is so good! Thank you for posting an awesome recipe! It's hard to get the right balance between sugar and canned tomatoes. But this recipe hits the spot. I like your blog. But are you able to eat all these stuff really? I am pregnant and right now i only eat three types of food: raw, cold and fried. I can't eat anything cooked – at all. I am a Muslim too, that means I never eat any kind of porc or bacon. Do you use chicken as part of breakfast sometimes? this blog is just AMAZING, so inspiring and everything looks just LOVELY. lots of love! I agree on the canned tomatoes and the fresh mushrooms. Both make a better spaghetti for sure. It is hard to get the right balance between sugar and canned tomatoes. But this recipe hits the spot. 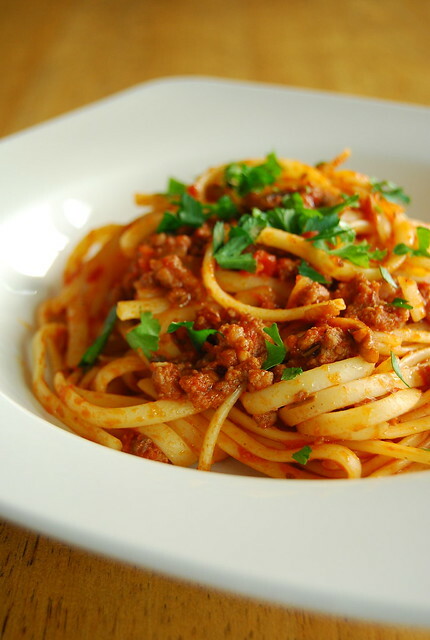 This is almost like the Bolognese style sauce .this looks super tasty and I love to try it.